My own hair is short and curly. I haven't had hair past my shoulders for about 20 years. The idea of having Disney princess hair was enchanting but I knew little about the process. How exactly are the extensions attached? How long does it take? How much does it cost? How long do extensions last? Time to do my research! I recently attended Canada's Walk of Fame black-tie gala in Toronto. (Those who follow my blogs will guess that I went because my Number One rockstar, Corey Hart, was honoured with his star this year. But, I digress.) Going to a star-studded formal event required a lot of beauty planning and preparation on my part. I'm not a girly girl. On a day-to-day basis, I don't fuss over my appearance. I get my hair cut and coloured regularly, and that's about it. I've had two manicures and one facial in my entire life. I never wear makeup. I pluck my own eyebrows. No, really. Some people still pluck! But a black-tie gala calls for putting on the glitz. Plus, it's fun to be a princess sometimes. The problem is, when you're a princess only once every few years, you don't have the required DIY skills. Applying false eyelashes, contouring with makeup, applying gel nails, and waxing are beauty regimes that are best left to the pros (or at least to those ladies with considerable experience). Something else best left to the pros is hair extensions. While you can be a princess with any length hair (or no hair at all), it's hard not to envision the long, flowing locks of the Disney girls when you think, "princess." The website for Jessica Hair Extensions answered a lot of my questions, and serendipitously, it has well-reviewed salons in Toronto and Vaughan. Perfect. It turns out that there are a number of different ways that hair extensions can be applied. One of the most popular is the hot fusion method, which uses heat and keratin to adhere small bunches of extensions directly to your own hair, near the roots. The results are realistic looking, and allow you to style your hair in a variety of ways -- including updos -- without worrying that people will be able to see the joins. This method also has long-lasting results, as your extensions can easily last two to four months, and sometimes longer. There are some downsides, though. The application can take two to four hours, and you need to be careful when styling your hair. Conditioners, oil treatments, and hot styling appliances to be kept away from the joins so that they don't weaken. Micro loop extensions (also called "micro bead" or "micro ring") have tiny loops at the top of each weft. Small sections of your own hair are then pulled through each loop as well. The loops are squished down with pliers so that their appearance is minimized. Because these extensions are applied without any kind of adhesive, they are easier on your hair, and super simple to remove. Another benefit is that the loops can be moved as your hair grows out, prolonging the life of your extensions. This method is not the best choice for people with short or thin hair, as the loops may be visible, especially near your crown. I was dubious about the whole idea of tape-in extensions, because really, how long can tape last? But tape-in extensions can last 2-3 months with proper maintenance. They are an excellent choice because the application process is quick (usually under an hour), and the extensions blend very well with your natural hair. Interestingly -- at Jessica Hair Extensions anyway -- the cost of extensions doesn't depend on the method of application, but on the type and brand of hair used, as well as the length. Extensions at reputable salons are made from human hair. Virgin hair (which has never been chemically treated in any way) is the most expensive. Remy hair may have been chemically treated, but is carefully cut and gathered while keeping the cuticles of the hair aligned, which helps prevent tangling and matting once the extensions are applied. Non-Remy hair is typically discarded hair, and in gathering it together, the cuticles become misaligned. Reputable salons don't normally use non-Remy extensions. The prices at Jessica Hair extensions range from $300 to $600, but price vary between countries, regions, and salons, so research the prices at the salon of your choice. If you're looking for something more temporary (and economical), you may want to consider clip-in extensions. 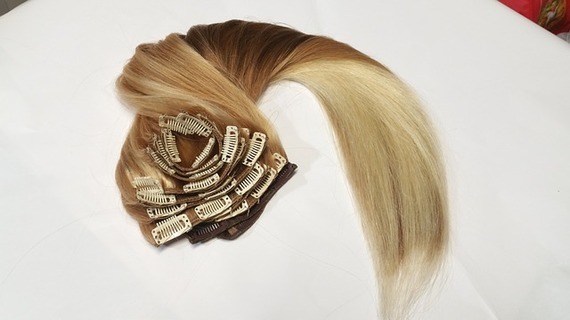 As the name suggests, wefts are attached to metal clips, which are then clipped into your own hair. While synthetic clip-ins can be super cheap (and fun to play with! 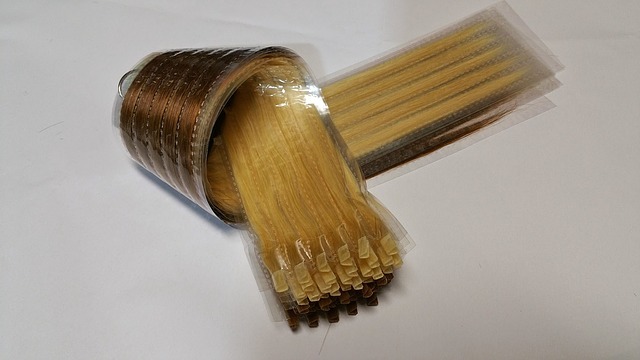 ), those made of human hair will last longer and may be more cost-effective in the long run. As for me, I did not get my chance to shine like Ariel from The Little Mermaid. Due to an unseasonable blizzard, whiteout conditions, one canceled flight, and one delayed flight, I ended up changing right at the airport, splashing some water and coconut oil on my (short) hair, and smearing on some Burt's Bees tinted lip balm. And then I ran -- yes, literally ran -- through Pearson International Airport in my gown and sneakers. I changed into heels in the car. Sometimes it works out well, not being a girly-girl. I don't think I could have made that dash in Manolos, while keeping my long hair from getting tangled in my cross-body bag, and my makeup from smudging.